If their January 17 title tilt will be anything like their heated “Counterpunch” segment on “UFC Insider,” UFC bantamweight champion TJ Dillashaw is in a world of trouble. 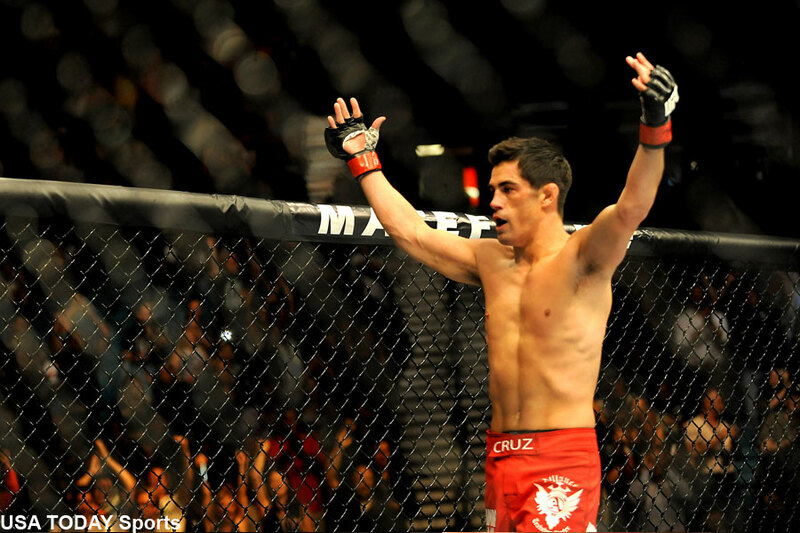 Challenger Dominick Cruz, who never lost the 135-pound belt but was stripped of it due to his injury prone past, seemed to have an answer for everything, whereas Dillashaw couldn’t muster up a solid defense for much of Cruz’s shots. Cruz also doubles as a Fox Sports 1 analyst for the UFC, so it’s understandable why he had the clear advantage over Dillashaw in the verbal warfare department. If Dillashaw didn’t don the hardware, you would kind of feel bad for him sitting there defenseless on his stool as Cruz ripped into him. Props to host Jon Anik for sitting silent while the bitter rivals bantered back-and-forth. Sometimes the best thing you can do is to do nothing. Dillashaw would prefer to do his talking inside the cage, and thankfully for him, that’s the only thing that will matter on January 17. I wonder who Urijah Faber was rooting for while watching this exchange? UFC Fight Night 81 takes place inside TD Garden in Boston, Massachusetts.